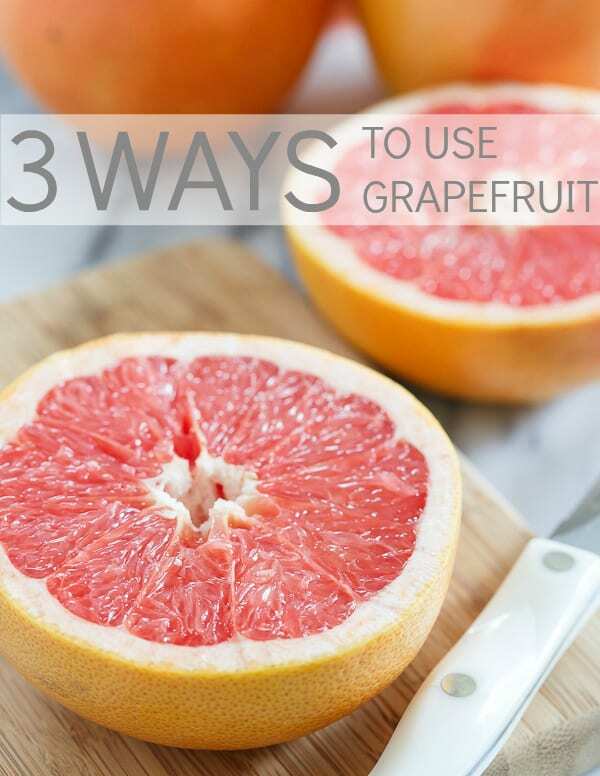 Try these 3 ways to use grapefruit this winter: brûlée it for dessert, turn it into grapefruit poppyseed dressing or make a quick and easy antibacterial household cleaner. It’s the final month of my partnership with Silk and bringing you seasonal/local eating recipes, ideas, and guides. It’s crazy to think this all started with a sweet pea lemon crepe cake back in May. Spring was just starting to give us fresh tender greens here in NY and we had a whole long growing season to look forward to. Today, on December 28th, things are a bit different. Despite the mild winter we’ve had so far, there’s pretty much nothing left at the farmer’s market from a local standpoint besides some leftover apples and a bunch of winter squash. So, while not local, grapefruit seemed at least a seasonally appropriate way to end this series. Of course you can do normal things like make a pickled fennel citrus salad or maybe a scallop citrus ceviche with it but I wanted to think a little bit outside of the box this time with these 3 ways to use grapefruit. You know what happens when you sprinkle brown sugar (or use coconut sugar for a paleo version), cinnamon and ginger on top of a grapefruit and then broil it in the oven for 5-7 minutes? Magic. Pure magic. Top it with a dollop of Greek yogurt and some chopped nuts and you either have a decadent addition to breakfast or a healthy dessert at your fingertips in just minutes. 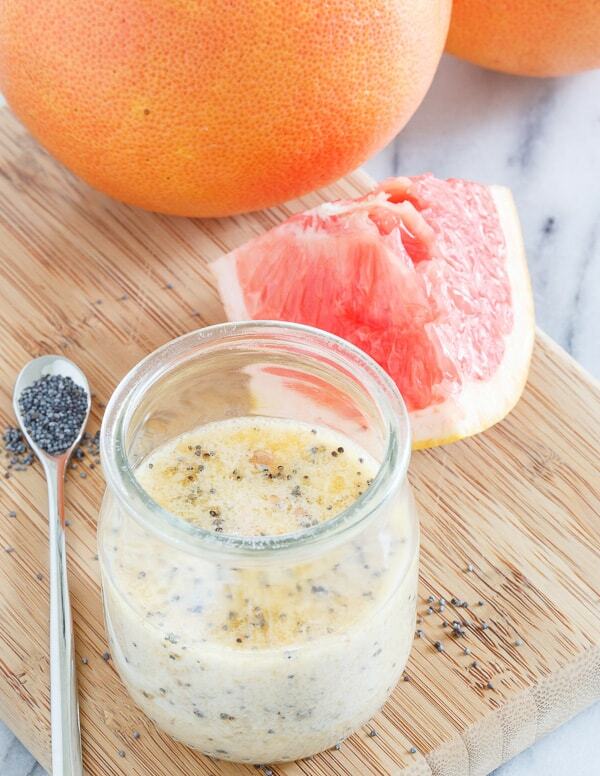 Using Silk unsweetened original almondmilk, make a dairy free grapefruit poppyseed dressing in just minutes. It’s a nice citrus addition to any winter salad (try it on this winter chopped kale salad for something different). The grapefruit brings a sweeter tang to the dressing than traditional lemon would. I dabbled in the whole essential oil thing earlier this year and was shocked at how easy it is to make your own cleaners and sprays. This DIY cleaner is naturally antibacterial and can be used on all sorts of surfaces like counters, sinks, showers, tubs and toilets. Place the grapefruit peel in a mason jar. Cover with vinegar, screw on the lid and let sit in a cool, dark place for about a week to infuse. Strain the vinegar and pour into a spray bottle. Fill the rest of the bottle with water and add a few drops of the tea tree oil (3-5 will do). Shake gently before using. Honey, dijon mustard and fresh grapefruit juice combine for a tangy, sweet dressing perfect on winter greens. Whisk together grapefruit juice, almondmilk, honey, dijon, salt and pepper in a small bowl until combined. Pour olive oil into the bowl while whisking until thoroughly incorporated. I NEED that grapefruit brulee for breakfast this morning! 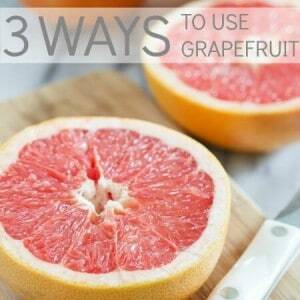 I always forget about grapefruit and this list is a great reminder to pick some up today – pinned! I love grapefruit in just about anyway but that bruleed grapefruit is calling my name! Oh and I love how you made that dressing dairy free! The brulee looks fantastic!! I have to sweet it up a lot, but grapefruit is always a nice change up! I’m not sure if I’m more excited about the bruleed grapefruit or turning it into a household cleaner! 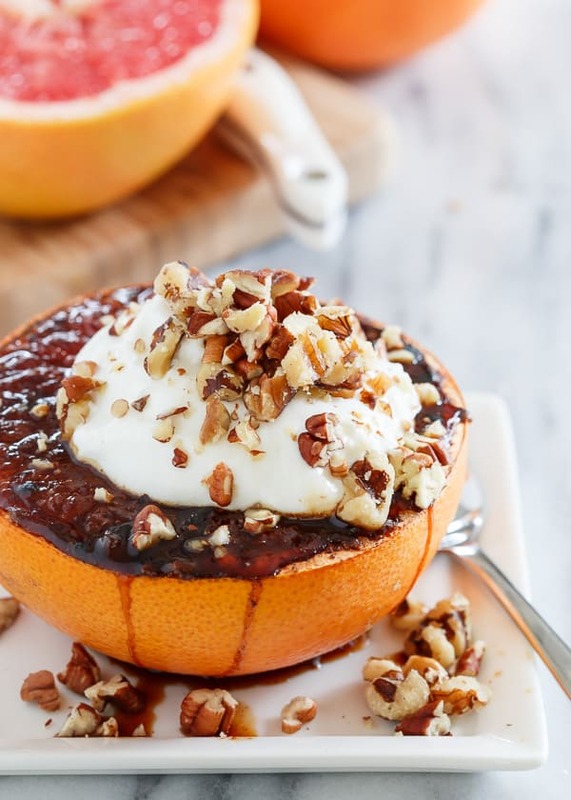 These are all great ways to use seasonal grapefruit! That grapefruit brûlée looks incredible! Like I need it for breakfast tomorrow! I the people only knew the many uses, they would be totally amazed. I’ve never been a big grapefruit fan – too tart for me, but this brulee—-I’m all over that!!! the dressing too!! I love these creative ideas! The cleaner is on my list to make soon! Aha! This is what you were up to the other day with the grapefruit! That brulee may just convert me to eating grapefruit for breakfast… Yum! Thanks for the idea inspirations, will have to try these!